Here this tutorial explains how to remove date from Windows 10 taskbar to see time only. In this post, I will list some handy methods to quickly remove date from Windows 10 taskbar. There are some simple tricks to make only time visible in taskbar but I was able to find some other tools to do the same. If you like desktop customization stuff then you will like to do this unique experiment with your Windows taskbar to make date disappear from it. By default, Windows allow you to remove date using Taskbar settings. But after doing that, it removes time as well. But this post will show you some workarounds to make system clock show time only. And not just this but with the additional tools that I have added, you will be fully able to customize the clock as well such as its font and font color. Before this, we have covered some posts about customizing system clock too for example, changing its orientation. How to Remove Date from Windows 10 Taskbar to See Time Only? 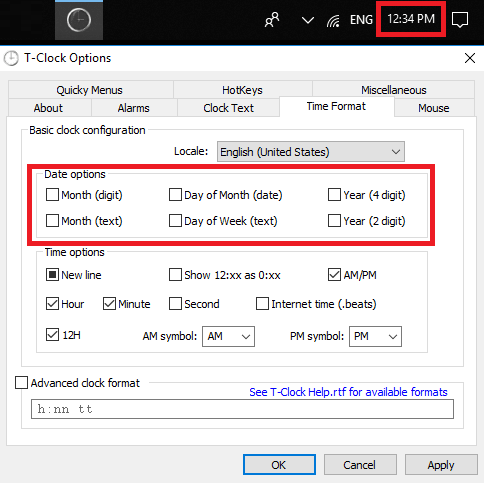 The first method for removing date from system clock to only make time visible in Windows 10 is very simple. And to do this, you don’t have to install any software on your PC. 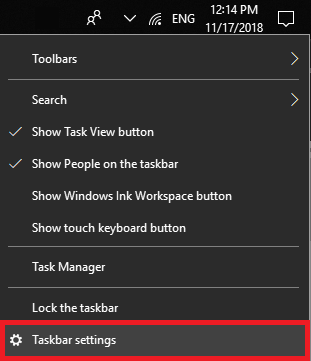 In this, method, you just enable the small icons option from the taskbar settings and it will magically remove date from the taskbar. However, this method will result in small taskbar icons which should be fine for you. After removing date, you can place the taskbar anywhere on your desktop. 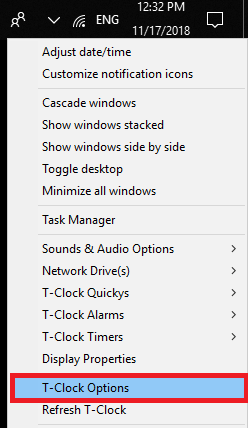 To do this, first right-click on the Taskbar and choose “Taskbar settings” option. Now, simply flip the switch associated with “Use small taskbar buttons”. As you do that, the changes will immediately reflect in the taskbar and it will remove date from it. 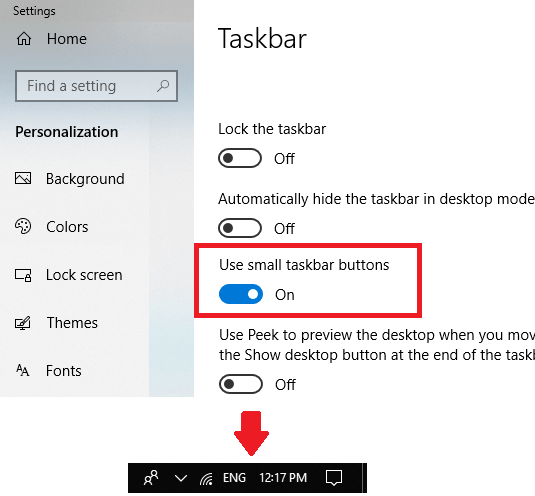 This is one simplest method that you can use to remove date from taskbar if you are okay with the small taskbar buttons. Otherwise, you can use the tools mentioned below. T-Clock is the best system clock replacement software out there for Windows 10. It is open source and offers a lot of clock customization options that you will surely like. Basically, it replaces the system clock with its own but you won’t be able to spot the difference. And the best part is that the clock that it adds is fully customizable. Changing aspects like color, font, size, can be done in a few click. Also, on the other hand, it lets you use custom date and time format for the clock which you can use to remove date from the taskbar and have only time. The time itself is customizable too as you can opt to add seconds to the clock as well. Download this software from above and then install it. After installation, it will replace the system clock with its own. You can also make it run automatically after startup. 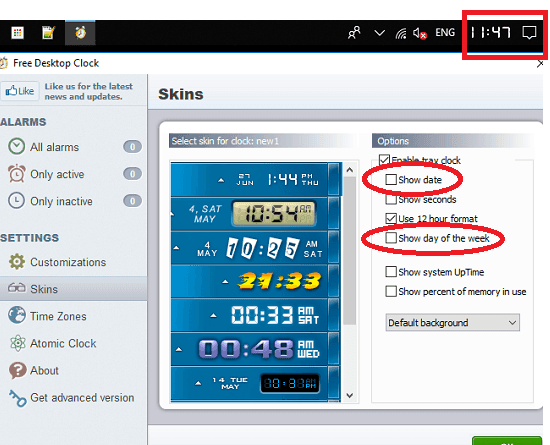 To customize the system clock, right-click on the clock and choose “T-Clock Options”. Now, from the T-Clock Options window, switch to the Time Format tab. In this tab, use the “Date options” section and uncheck all the entries. Next, apply the changes and the date should be removed by now from system clock. See following screenshot. You can see how this simple software works to help you remove date from the system clock. You can easily use it to make taskbar show time only. Not only this but there are other customization options which you can use to change the look and feel of the system clock. Free Desktop Clock is another software which can help you remove date from Windows 10 taskbar. Just like software above, it does the similar thing. It replaces the system clock and then you can customize the clock that it adds to make Windows taskbar show time only. There are several clock skins in it that you can use and customize them. In addition to this, there are some extra features it offers like alarm and talking clock. Using this software is very simple. Just install it and it will replace the system clock with its own. After that, you can customize the system clock that it adds to remove date. Right click on the clock and then select “Main Dialog…” option. After that, simply uncheck “Show date” and “Show day of the week” options. Now, the clock will only show time. These are top ways to remove date from Windows 10 taskbar to see time only. If you are looking for some simple way to make taskbar show time only then this post will come in handy. All the methods work like charm and you can tell me other way around if you know one.